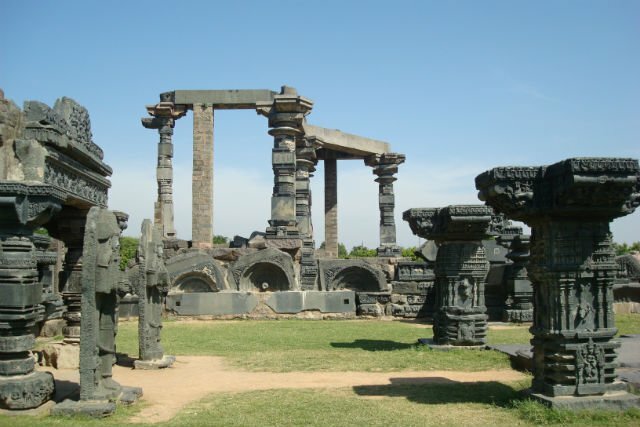 About 140 km from Hyderabad is Warangal, the capital of the Kakatiya dynasty that flourished in the 12th century. The road curved and arched into a fortified stone wall embellished with sculptures and yalis – mythical creatures believed to be more powerful than lions and elephants – carved in stone. An entire settlement lay behind those walls. We were in the old Warangal Fort, capital of the Kakatiya dynasty. Sculptures were strewn all around us, and enclosing them were four massive stone pillars 30 feet tall, each facing a cardinal direction. The scattered sculptures lay open to the skies. A Shiva temple was surrounded by ornate pillars, shorter than the four main massive pillars. These tall gateways symbolized “gateways of glory” called Kirti Thoranas and were the seat of the Kakatiyas in Warangal. A couple of elephants, a nandi, more yalis, a few pillars, broken sculptures, a gajakesari and even an old throne, lay enclosed by the kirti toranas, open to the sky. Shiva, called “Swayambhu”, was worshipped here by the famous Kakatiya ruler Prataparudra. We sat near the throne and looked around. Two dogs chased each other. I walked over to the map, which gave me the history of Warangal. Earlier known as Orugallu or Orukal, referring to the single boulder or hillock where the fort was located, it was also called Ekasilanagaram. The map told me that the fort, built in the 12th century by the Kakatiya king Prola Raja and his son Rudra Deva, was ruled by Ganapathideva. The most important ruler of the Kakatiyas was not a king, but a queen – Rudramma Devi, who held fort here in the following century. The fort had three concentric fortifications, two walls, and there seemed to be a trace of the third. Of the four gates, facing the cardinal directions, the east and west gates were still in use. Besides 45 towers and pillars spread over a radius of 19 km, there was also a moat surrounding the fort. The fort was today completely in ruins and was largely destroyed by Malik Kafur as the dynasty fell to the Delhi Sultanate. The Kakatiyas were the ancient rulers of today’s Andhra Pradesh and it was probable that their early reign was fused with the advent of Buddhism in the region. Some historians infer the period to be dated somewhere in the middle of the 7th century when Hiuen Tsang, the Chinese pilgrim, had referred to the kingdom as Danakaktiya. Even Marco Polo mentioned Warangal much later in his travels. The dynasty’s name came either from its association with a town known as Kakatipura or from their worship of a goddess called Kakati. It was assumed that Kakatipura is present day’s Warangal. The silence in the fort was soothing as we gazed at the sculptures. As we walked inside the old settlement, life seemed to be the same. Posters of local heroes and politicians jostled for space as young couples, probably students, sought privacy in the temples atop a small hillock overlooking a lake. Nobody was in a mood to entertain tourists as they shly evaded our questions, embarrassed at being spotted. We continued, driving towards Hanamkonda, Warangal’s twin town located barely 10 km away. ”It is like Hyderabad and Secunderabad,” said my driver, interrupting my reverie as we entered Hanamkonda. My guide book said that Hanamkonda was the former capital of the Kakatiyas and it was later shifted to Warangal. The seamless road took us past the busy market with retail brands jostling for space. Hoardings screamed for attention, but I hardly saw any monument of heritage relevance. Huge sacks of onions and potatoes were piled in the local grocery shops. It was nowhere close to the idyllic historic town I had painted in my mind. We stopped before a narrow congested lane and walked through it. It led us to the thousand-pillar temple built in the 12th century. We spoke to a local man who said that the temple has been under renovation for a while and that a well was discovered here earlier and it was believed that the temple may have been built on water and it took more than 70 years to build. The ASI signboard gave us more information. The temple, built by Rudra Deva I in the 12th century, was dedicated to Shiva, Vishnu and Surya. The pilllars graced the mandapa and between the main shrine and the mandapa was a pavilion for a massive Nandi. Records showed that the Kakatiyas were feudal lords of the Western Chalukyas around the 10th century. The reign probably started with Betaraja I, followed by his descendant, Prola Raja I. Hanumakonda, which was secured as a grant by Prola Raja I from the Western Chalukyas, was the capital of a dynasty that had just started establishing itself. We then stopped at the Bhadra Kali temple on a small hillock, believed to have been the patron goddess of the dynasty, and then proceeded to Palampet where the beautiful Ramappa Lake adjoining the 13th-century temple awaited us. Watching the sun going down on the lake, which was believed to be as ancient as the temple, I wondered how a rich capital, a seat of power where battles were fought and won, was today a town forgotten, alive only in textbooks. My trail ended here but the Kirti Toranas remained in our minds – pillars of yesteryear’s glory lost to modern civilisation. Warangal is 140 km from Hyderabad and can be reached by road or rail. Trains and buses ply regularly from Hyderabad, which is about three hours (or longer, depending on the number of stops en route) by road. Accomodation is simple and there are a couple of three-star properties. Do not miss the local dish, the Pesarattu Dosa made of moong dal (green gram). This entry was posted on May 18, 2012 at 1:37 AM	and is filed under India Forgotten. Tagged: ancient architecture, Beauty, civilizations, nature, splendour, the hindu empire. You can follow any responses to this entry through the RSS 2.0 feed. Both comments and pings are currently closed.